Christmas is a time when lots of gift shoppers will check out your store for the first time, so it’s prime time for lead acquisition. 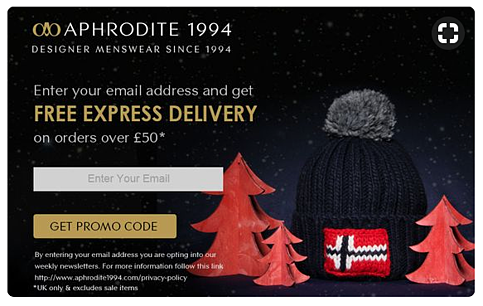 Consequently, it’s a clever idea to include a festive version of your pop up on your site, highlighting any seasonal deals whilst also inviting browsers to sign up for your emails. Here’s an example from Aphrodite 1994, spotted on Pinterest. As you can see, it incentivises gift shoppers to sign up in exchange for free express delivery (when they spend over £50). Once you’ve managed to convince a shopper to sign up to your newsletter, it’s time to send a welcome email. Some brands choose to use the same template for their welcome email/s all year round. However, this is unlikely to get festive shoppers excited about what you have to offer them for the holidays. For leads who sign up during November and December, you don’t just want to convey key brand messages, but also make sure they’re aware of your most important festive offers, dates and deadlines. 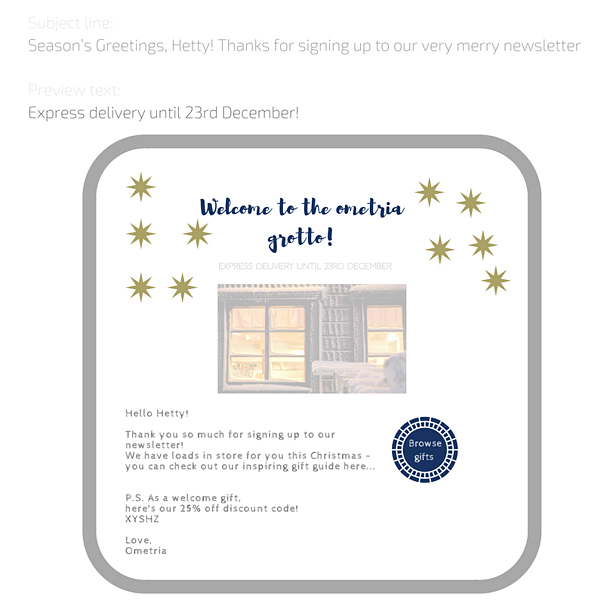 Best time to send: To keep a new subscriber engaged, send them a festive welcome note pretty much straight after they’ve signed up to your newsletters. Subject line: Now for getting your welcome email opened. Firstly, personalise the copy using any data submitted during the sign up process; for example, a recipient might have provided their name and/or country/geographic location, or specified the sort of content they want to receive from you. E.g. Season’s Greetings, Hetty! Thanks for signing up to our very merry newsletter. Alternatively, preheader text can be used as a way to hint at your key promotional messages, found in more detail inside the email. “Welcome to [brand name]'s grotto!" Again, the copy of your welcome email is a great opportunity to include all your festive offers and key dates, but it’s also important to remember to say thank you for signing up. If you sell in different countries or territories, use dynamic content to send each recipient a calendar event link with a reminder of when they need to place their order by in order to receive it before Christmas Day. Dynamic discount: The discount you offer in your welcome email over the festive period may be different to the one you offer newbies throughout the rest of the year, depending on any special offers or promotions you have going on. 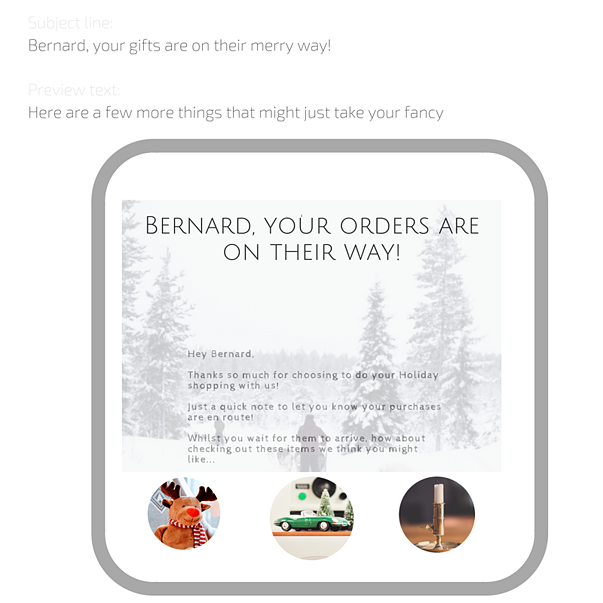 Here's a mock up of what this festive email template might look like. Add in a few more calls-to-action (CTAs) and social icons and you'd be good to go! During the Christmas period, you’ll likely notice a real spike in the number of visits to your site, and will probably receive a lot views on certain stocking-filler-worthy products. This is gift shoppers figuring out what to buy loved ones, friends or colleagues they barely know (...cheers, Secret Santa!). When to send: Christmas is the season of spontaneous spends, so ensure your abandonment emails (browse and cart) are quick off the mark (preferably within the first hour of abandoning). 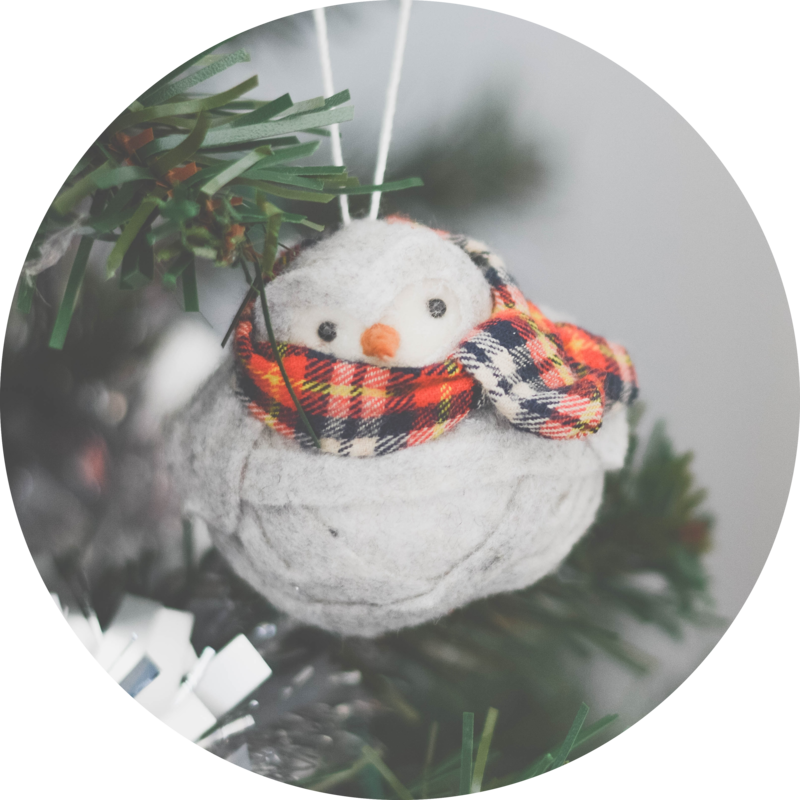 Subject line: From quoting Christmas carols to using endless tree-puns, there are so many ways you can tweak the wording of your subject line to make it more Christmassy. On a more technical note, use dynamic content to incorporate relevant information (such as recipient name, product viewed) and boost the chances of your browse abandonment email being opened. Copy and content: If it's a shopper who hasn’t interacted with you since last Crimbo, appeal to gift shopper mentality in them e.g. if displaying product viewed, the headline could be: “They come gift-wrapped!”. (You can read more about how to spot a gift-shopper here). An accompanying image could then be the product itself or category viewed. 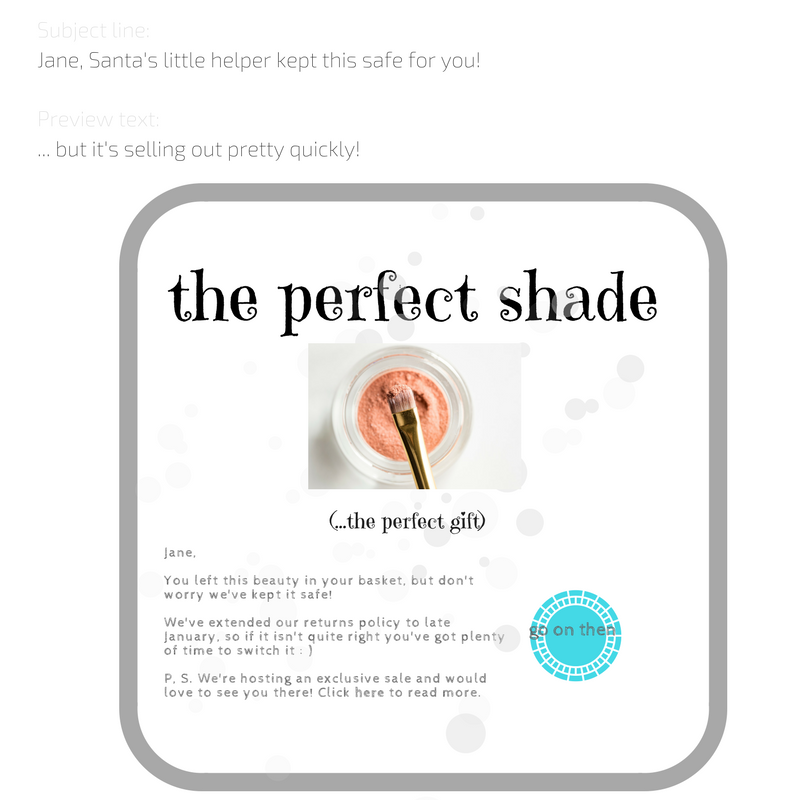 If you want to include product recommendations in your festive browse abandonment email, try using an engine that draws on the category viewed or the most popular items from your gift guide. More on product recommendation engines here. Dynamic discount: The exact nature of the discount you offer in your browse abandonment email will depend on factors such as the recipient's lifecycle stage (e.g. for a VIP could recipient, you could offer next-day delivery for one month, whereas for lapsed customers you could try offering a more concrete [x] per cent off to try and seal the deal). Oh, and if the recipient of your browse abandonment email hasn’t yet made a purchase with your brand, remind them of their welcome discount. 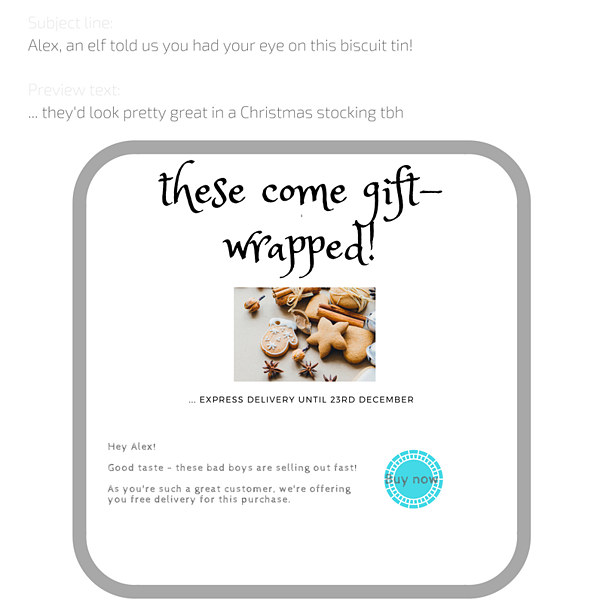 Here's a mock up of what this festive email template might look like. Add in a few more CTAs and social icons and you'd be good to go! When to send: As mentioned above, for this time of year it’s best to send abandonment emails within the first hour of abandoning. Copy and content: Dynamic content can ensure each email displays a headline appropriate to the item the recipient has left behind (accompanied by an image of that product or category). For your hero image, consider simply updating the imagery found in your usual abandonment emails to something more festive. Again, don’t forget to include dynamic product recommendations—they’re a great way to target those having second thoughts about what was in their basket. If you're a fashion retailer, you could even make sure the size of recommended products is the same as item viewed. Recipients being sent a cart abandonment email will be so close to shopping with you, so include any messaging likely to give them the confidence to hit 'checkout'. One way to do this is to remind them you’ve extended your returns policy beyond Christmas (to, say, mid to late January), giving them the piece of mind that they can always return the item if it’s not right. Dynamic discount: As mentioned in the point above: personalise the amount or very nature of your discount according to where the recipient is in their journey with your brand (e.g. whether they are a lead, VIP, lapsed customer etc…). With a sky-high open rate, post-purchase emails are a golden opportunity for you to communicate your brand’s Christmas offering to existing customers (and encourage a speedy follow-up order). When to send: Shorten the send time of your follow up emails (again, so that they are guaranteed to arrive in time for gift-giving). Subject line: Use a personalised subject line as a way to assure a customer their order is on its way and generate excitement around the purchase. E.g. “Bernard, your copy of “Catch-22” is on its merry way! Copy and content: As well as displaying the product(s) purchased, include a festive image depicting the fact the receipient's order is on its way; we're thinking, a sledge in the sky full of gifts, or a postman delivering parcels in the snow. You get the picture. You can accompany this with a personalised headline that talks directly to the recipient. E.g. "Bernard, your gifts are on their way to London! To encourage that follow-up order, include personalised product recommendations based on factors such as the product purchased or, if they are a regular shopper, their taste profile. To mix things up a bit, you could also try using open time personalisation to include a countdown to key dates, such as Christmas Day or Hanukkah. Dynamic discount: For a post purchase email, try and incentivise a follow up purchase by offering free shipping on any items they forgot to buy. VIP email: If you currently send automated loyalty emails (i.e. emails saying thanks to your best customers) trying turning this into a more festive message/ Christmas card. Wish-list: Make your wish-list emails Christmas themed by incorporating a “drop-a-hint” campaign.